"Because Christian morality leaves animals out of account," wrote Schopenhauer, "they are at once outlawed in philosophical morals; they are mere ‘things,’ mere means to any ends whatsoever. They can therefore be used for vivisection, hunting, coursing, bullfights, and horse racing, and can be whipped to death as they struggle along with heavy carts of stone. Shame on such a morality that is worthy of pariahs, and that fails to recognize the eternal essence that exists in every living thing, and shines forth with inscrutable significance from all eyes that see the sun!" According to the Bible, animals have souls. Texts such as Genesis 1:21,24 are often mistranslated to read "living creatures." 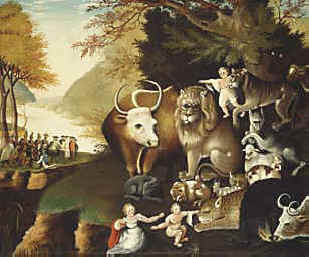 The exact Hebrew used in reference to animals throughout the Bible is "nephesh chayah," or "living soul." This is how the phrase has been translated in Genesis 2:7 and in four hundred other places in the Old Testament. Thus, Genesis 1:30 should more accurately read: "And to every beast of the earth, and to every fowl of the air, and to everything that creepeth upon the earth, wherein there is a living soul, I have given every green herb for meat." God breathed the "breath of life" into man, and caused him to become a living soul. (Genesis 2:7) Animals have the same "breath of life" as do humans. (Genesis 7:15, 22) Numbers 16:22 refers to the Lord as "the God of spirits of all flesh." In Numbers 31:28, God commands Moses to divide up among the people the cattle, sheep, asses and human prisoners captured in battle and to give to the Lord "one soul of five hundred" of both humans and animals alike. Psalm 104 says God provides for animals and their ensoulment. "O Lord, how innumerable are Thy works; in wisdom Thou hast made them all! The earth is full of Thy well-made creations. All these look to Thee to furnish their timely feed. When Thou providest for them, they gather it. Thou openest Thy hand, and they are satisfied with good things. When Thou hidest Thy face, they are struck with despair. When Thou cuttest off their breath, in death they return to their dust. Thou sendest Thy Spirit and more are created, and Thou dost replenish the surface of the earth." Similarly, the apocryphal Book of Judith praises God, saying, "Let every creature serve You, for You spoke and they were made. You sent forth Your Spirit and they were created." Job 12:10 teaches that in God’s hand "is the soul of every living thing, and the breath of all mankind." Ecclesiastes 3:19-20 says humans have no advantage over animals: "They all draw the same breath...all came from the dust, and to dust all return." The verse that immediately follows asks, "Who knows if the spirit of man goes upward, and the spirit of the beast goes down to the earth?" The exact Hebrew word for "spirit," "ruach," is used in connection with animals as well as humans. Ecclesiastes 12:7 concludes that "the spirit shall return unto God who gave it." This position was taken by Paul, who called himself an apostle to the gentiles. Paul spoke of God as the "giver of life and breath and all things to everyone." (Acts 17:25) In his epistle to the Romans 8:18-25, Paul wrote that the entire creation, and not just mankind, is awaiting redemption. Revelations 16:3 also refers to the souls of animals: "The second angel poured out his bowl upon the sea, so that it turned to blood as of a corpse, and every living soul that was in the sea died." The exact Greek word for soul, "psyche," was used in the original texts. English theologian Joseph Butler (1692-1752), a contemporary of John Wesley’s, was born in a Presbyterian family, joined the Church of England, and eventually became a bishop and dean of St. Paul’s. In his 1736 work, The Analogy of Religion, Bishop Butler became one of the first clergymen to teach the immortality of animal souls. "Neither can we find anything in the whole analogy of Nature to afford even the slightest presumption that animals ever lose their living powers, much less that they lose them by death," he wrote. The Reverend John George Wood (1827-89) was an eloquent and prolific writer on the subject of animals. A popular lecturer on the subject of natural history, he wrote several books as well, such as My Feathered Friends and Man and Beast—Here and Hereafter. Wood believed most people were cruel to animals because they were unaware that the creatures possessed immortal souls and would enjoy eternal life. One of the most scholarly studies on the issue of animal souls was undertaken by Elijah D. Buckner in his 1903 book The Immortality of Animals. He concluded: "...The Bible, without the shadow of a doubt, recognizes that animals have living souls the same as man. Most of the quotations given are represented as having been spoken by the Creator Himself, and he certainly knows whether or not He gave to man and lower animals alike a living soul, which of course means an immortal soul." Influenced by Aristotle, Augustine and Aquinas, the Church of Rome maintains that animals lack souls or divinity, even though such a doctrine contradicts many biblical passages. Previously, during the Synod of Macon (585 AD), the Church had debated whether or not women have souls! Women in the Western world are finally being recognized as persons in every sense of the word—social, political and spiritual. Animals have yet to be given the same kind of moral consideration. bullfighters, became the first Pope to bestow his benediction upon one cruelty even the Church had condemned. "But let us suppose for a moment that it could be shown that animals lack immortal souls, does it follow that their moral status is correspondingly weakened? It is difficult to see in what sense it could be. If animals are not to be recompensated with an eternal life, how much more difficult must it be to justify their temporal sufferings? "If, for an animal, this life is all that he can have, the moral gravity of any premature termination is thereby increased rather than lessened...In short, if we invoke the traditional argument against animals based on soullessness, we are not exonerated from the need for proper moral justification. "Indeed, if the traditional view is upheld, the question has to be: How far can any proposed aim justify to the animal concerned what would seem to be a greater deprivation or injury than if the same were inflicted on a human being?" "Mark Twain remarked long ago that human beings have a lot to learn from the Higher Animals," writes Unitarian minister Gary Kowalski, in his 1991 book, The Souls of Animals. "Just because they haven’t invented static cling, ICBM’s, or television evangelists doesn’t mean they aren’t spiritually evolved." "I am a parish minister by vocation," Kowalski explains. "My work involves the intangible and perhaps undefinable realm of spirit. I pray with the dying and counsel the bereaved. I take part in the joy of parents christening their newborns and welcoming fresh life into the world. "I occasionally help people think through moral quandries and make ethical decisions, and I also share a responsibility for educating the young, helping them realize their inborn potential for reverence and compassion. Week after week I stand before my congregation and try to talk about the greatest riddles of human existence. In recent years, however, I have become aware that human beings are not the only animals on this planet that participate in affairs of the spirit." "Animals, like us, are microcosms," says Kowalski. "They too care and have feelings; they too dream and create; they too are adventuresome and curious about their world. They too reflect the glory of the whole. "Can we open our hearts to the animals? Can we greet them as our soul mates, beings like ourselves who possess dignity and depth? To do so, we must learn to revere and respect the creatures, who, like us, are a part of God’s beloved creation, and to cherish the amazing planet that sustains our mutual existence. "Animals," Kowalski concludes, "are living souls. They are not things. They are not objects. Neither are they human. Yet they mourn. They love. They dance. They suffer. They know the peaks and chasms of being." THEY SHALL NOT HURT OR DESTROY is available in print copy from Vegetarian Advocates Press, PO Box 201791, Cleveland, OH 44120, at a cost of $15.00 US per book including shipping and handling.